Iceland has great food. There, I said it. In working on the new Rick Steves Iceland guidebook, co-author Ian Watson and I were determined to get our readers past the clichés about Icelandic cuisine. 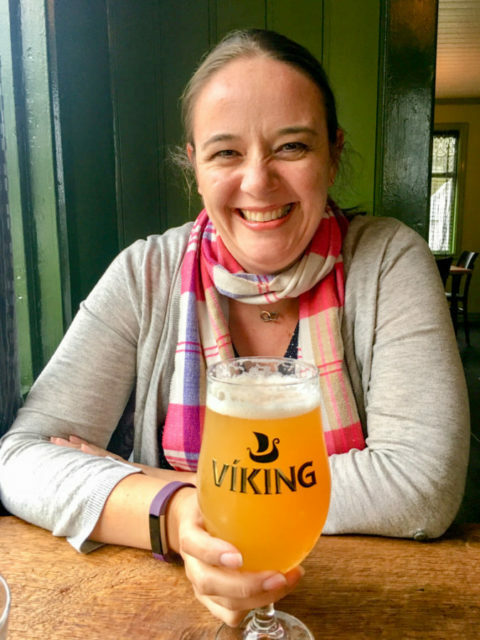 This post (from my Iceland blog series) offers an introduction to Icelandic cuisine, followed by my 10 favorite restaurant finds for the book. It’s the rotted shark that you always hear about. Which is a shame. And that’s just the tip of the “weird foods” iceberg. Icelanders are also notorious for their penchant for fish jerky (harðfiskur), and for tucking into an entire lamb’s head on a plate (called svið; the cheeks are nice and tender…the eyes and tongue are optional). To be fair, it’s hard to blame those early settlers for making the absolute most out of anything edible. Icelanders even have a word for their hardship meats: þorramatur (“winter food”). However — now that we’ve got that out of the way — there’s so much more to Icelandic cuisine than those infamous hardship foods. These days, most Icelanders would only eat those dishes out of nostalgia, or — like tourists — on a dare. The truth is, Iceland has a surprisingly dynamic, delicious, and fun-to-explore food scene. Iceland has a long history of absorbing cultural influences from across the sea. 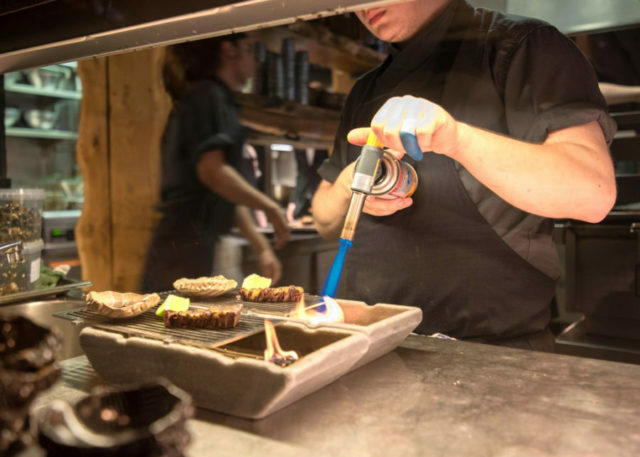 And now that the country is trendy with upwardly mobile young people from the United States, Icelandic chefs are masterfully melding their own traditions with world-class know-how. Icelandic lamb — which you’ll see free-ranging through the countryside — is renowned for its tenderness and its succulent flavor. Every Icelandic grandma has her own recipe for kjötsúpa — lamb soup. And then there’s whale. When considering the food chain, many otherwise-omnivores decide to draw the line just below whales. And, controversially, Iceland is a rare country where whale is still legally hunted and eaten. Those who support Icelanders’ right to whale point out that they only hunt minke whale, which is in no way endangered. And it seems shortsighted to judge Icelanders’ historical need to harvest whatever protein they could from the North Sea, as a matter of survival. On the other hand, very few contemporary Icelanders eat whale — the majority of whale caught here is sold to curious tourists (or exported to Japan). You could make a very strong case that today, whaling is kept alive not by Icelanders, but by tourists. Whether to sample whale is an individual choice; if you do, expect a flavor somewhere between elk and ahi tuna — gamey red meat, but unmistakably of the sea. Another Icelandic treat worth seeking out is licorice. Like other Scandinavians, Icelanders enjoy mixing licorice with salt or with chocolate. Strolling the candy aisle reveals a world of tempting Icelandic candy bars — most of them a mix of licorice and milk chocolate. And, unlike all those made-in-China stuffed puffins, these candy bars are an authentically Icelandic (and very affordable) souvenir. On my last day in Iceland, I like to stock up for the folks back home. Iceland has a young but thriving microbrew scene that resembles the one Stateside. Several pubs in Reykjavik offer an education in Icelandic brewers (good choices include the mellow, serious Skúli Craft Bar and the more touristy MicroBar; two other microbrew spots — Mikkeller & Friends and Ölverk — are recommended below). But be ready for very high alcohol prices. I was tempted to try a flight of five little Icelandic beers, until I did the math and realized it cost $30. Many budget-conscious tourists stock up on macrobrews at the airport’s duty-free store on arrival in Iceland. Most bars have happy hours, when, instead of paying $15 for a pint of microbrew, you might pay $10 or less. Most restaurants you’ll encounter serve Icelandic fare that’s updated rather than purely traditional. And high-end restaurants aspire to the New Nordic model of their Scandinavian cousins, mixing locally sourced ingredients, traditional influences, and cutting-edge culinary techniques. At the cheaper end of the spectrum is an abundance of low-end “international cuisine” (read: junk food). 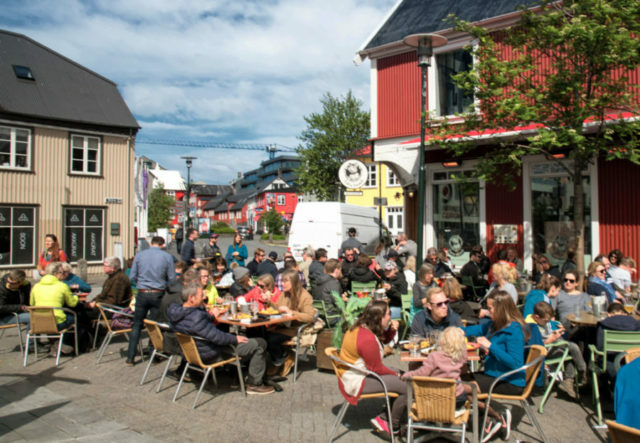 Like visitors, Icelanders find food prices staggeringly high; pizza, hot dogs, Subway sandwiches, and the IKEA cafeteria are just as popular in suburban Reykjavík as they are in suburban Raleigh. In short, expect high-quality food, at very high prices. And consider this very counter-intuitive tip: In a land where $30 buys you a totally forgettable dinner in a nondescript eatery…why not step up to $50 for a really memorable dinner? While this “in for a penny, in for a pound” philosophy will somewhat increase the price of your trip, it also boosts your culinary memories. Foodie friends have told me they were disappointed by Iceland’s food scene…then confess that they mostly ate hot dogs, Thai carryout, and groceries. Look, I get it: Iceland is expensive, and if you can’t afford to splurge, you can’t afford to splurge. There’s no shame in filling the tank cheaply (which, here, means $15-20 per person). 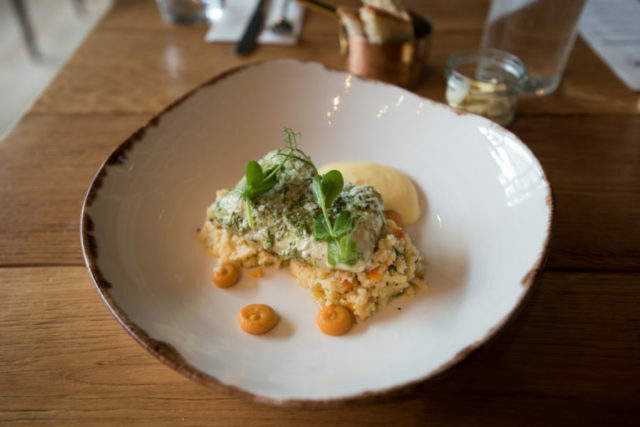 But if you really care about food, consider it part of the Icelandic experience to invest in one or two meals at good restaurants that truly represent Icelandic cuisine today. To facilitate this, my favorite budget tip is to frequent top-end restaurants at lunchtime, when almost every eatery offers a high-quality “fish of the day” or lunch special in the $20 to $30 range (compared to $50 for a dinner entree). Then, at dinnertime, you can economize by grabbing a pizza or a hot dog, or assembling a picnic. And by the way, don’t be mesmerized by the colorful convenience stores that line major streets, which mark up food prices dramatically. To save, stock up at one of Iceland’s budget grocery chains, Bónus or Krónan. To fight the sticker shock, remind yourself that prices include tax. And Icelanders never tip — so you shouldn’t, either. What you see is what you pay. By being aware of some of these key budget tips, and strategically mixing and matching picnic/fast food and splurge meals, you can return from an Iceland trip with some good food experiences under your belt, and a few krónur left in your pocket. Scouring Iceland for three weeks for our new Rick Steves Iceland guidebook, I was on a mission to come up with as many great edible discoveries as possible. A few of these stick in my mind as personal favorites. These 10 favorites — a variety of trendy hotspots and traditional standbys, listed in no particular order — are the places I’ll be sure to head back to on my next trip. Thanks to our co-author, Ian Watson, for recommending many of these. And thanks to my blog readers, who suggested others when I solicited their tips before my trip. Reykjavík’s “Hipster Corner.” This colorful little corner of Reykjavík, just a few steps up from the Laugavegur pedestrian drag, is made-to-order for a memorable coffee break. Reykjavík Roasters painstakingly brews top-end, third-wave coffee, literally weighing each portion of grounds to ensure a perfect pull. There can be a line, but while you wait, you can relax in the mismatched-furniture interior and play DJ with the record collection. Just a few steps downhill, a wildly colorful, graffiti-slathered storefront hosts Brauð & Co, a fantastic bakery with some of the best cinnamon rolls and other sweet pastries I’ve had. These two shops provide my favorite breakfast (and, let’s be honest, also my favorite afternoon snack) in Iceland. Tasting Menu at Grillmarkaðurinn, Reykjavík. On my first evening in Reykjavík, I splurged on dinner at this fine downtown eatery — which is trendy, rustic, upscale, and unpretentious at the same time. And three weeks later, on my last night in Iceland, I couldn’t resist going back to repeat the experience for a trip-capping blowout dinner. Once I’m convinced that I’m dealing with a quality restaurant, I’m willing to really commit money and stomach space to a serious experience. So I splurged on the $110 tasting menu — and it was worth every króna. For a memorable blowout meal in the capital, this is my top pick. Pizza, Cocktails, and Microbrews at the Mysteriously Hip Old House at Hverfisgata 12, Reykjavík. This classic old house, on a corner just a few steps from the main drag, hides several options for eating and drinking. From street level, go up the stairs and let yourself inside. You’ll find a cocktail bar in the basement; in the middle of the building is a proudly no-name pizza place with tasty wood-fired pies; and upstairs is the beer-snob haven called Mikkeller & Friends, specializing in Scandinavian microbrews. If you’re exploring the cozy, rustic, wood-paneled rooms and find yourself confused about which seating goes with which business…so is everyone else, so don’t be afraid to ask. Once settled in, dining or drinking here feels like hanging out at your Icelandic cousin’s house. To cap it all off, just around the corner (but in the same building) is Dill, a high-end New Icelandic restaurant that owns the country’s only Michelin star (reserve months in advance). Meatless Burgers at Kaffi Vínyl, Reykjavík. 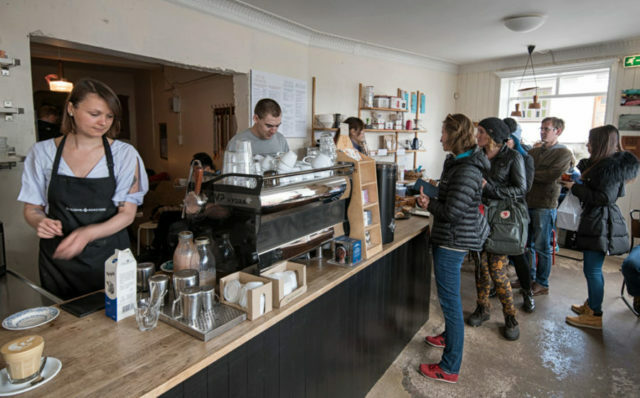 For a combination of mellow hangout and vegan sandwiches so good you’ll never miss what’s missing, drop by Kaffi Vínyl, just a block off of the main Laugavegur pedestrian drag. Choose from a chalkboard menu of enticing hot sandwiches, with the option of upgrading with some tasty “Oumph!” meat substitute. Wednesdays through Saturdays after 8 p.m., DJs spin hangout tunes, creating a vibe that makes you want to throw your itinerary in the harbor. 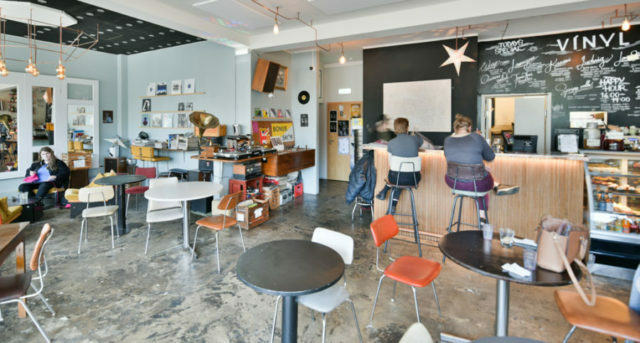 If I were an Icelandic hipster (oh don’t I wish)…I’d hang out here. Kaffihús Vesturbæjar, après-pool drinks in suburban Reykjavík. Most of these “discoveries” are smack-dab in the middle of Reykjavík’s touristy core. To escape into the suburbs, where you’ll be surrounded by more Icelanders than travelers, go for a dip at Vesturbæjarlaug — one of the capital region’s most appealing municipal thermal swimming pools. And before or after your pool visit, grab a drink or a bite at Kaffihús Vesturbæjar, an inviting and local-feeling neighborhood café across the street. They serve good breakfasts and lunches from a small menu chalked on the board. This is the kind of place where you hide your guidebook, melt into the convivial scene, and pretend you live here. Ölverk Microbrewery/Pizzeria, Hveragerði. About 45 minutes outside of Reykjavík, where the lunar plateau called Hellisheiði gives way to a steaming valley, sits the workaday little town of Hveragerði. And a couple of blocks in from the main road, facing a potholed strip-mall parking lot, is this delightful, family-friendly brewpub/pizzeria. Tipped off by a beer lover at the other end of the country, I wandered into Ölverk just days after it had opened…and my travel writer’s “spidey sense” went haywire. This place is a find. The beer — which, they brag, is made with natural geothermal power harnessed from the hazy hillsides all around — is top-quality. And the busy wood-fired oven fills the place with the mouthwatering promise of delicious pizza, with an emphasis on creative toppings. Ölverk is ideally located on the way back home to Reykjavík from a South Coast or Golden Circle day trip — but be prepared to wait at busy times. Slippurinn Restaurant, Westman Islands. 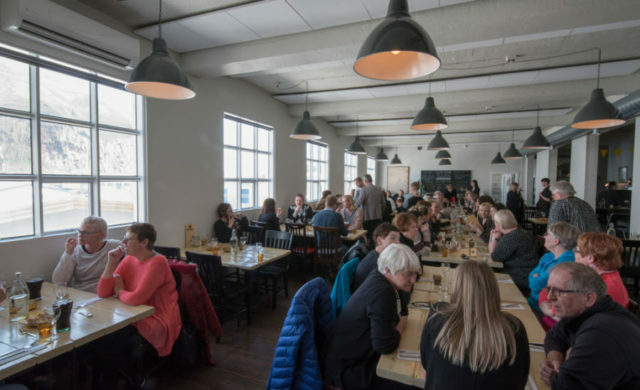 One of the best meals I had in Iceland (and that’s saying something) was at this delightful restaurant filling the upper floor of an industrial-mod former machine shop, overlooking the picturesque harbor in Heimaey. After launching a successful restaurant in Reykjavík, chef Gísli Matthías Auðunsson brought his know-how back home to the Westman Islands and opened a top-quality eatery. The space is bright, cheery, and filled with flowers. And the food — emphasizing Icelandic tradition, but with an accessible modern approach — is delicious, ranging from halibut soup to delectable lamb. 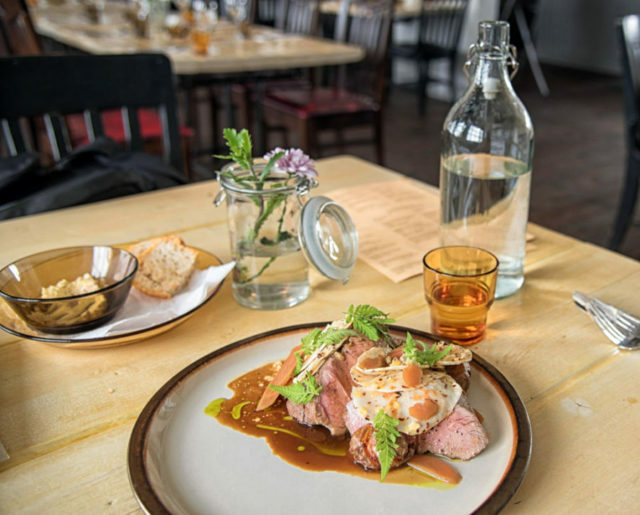 You’ll enjoy Reykjavík-quality food at Reykjavík prices, but it’s more affordable at lunch — and definitely worth reserving ahead if you’re doing a day trip to the islands. Norð Austur Sushi Restaurant, Seyðisfjörður. When I first heard about this restaurant — in a tiny village at the far-northeast corner of Iceland, a 10-hour drive from Reykjavík — I thought, “Sushi in rural Iceland? Really? Really. Really? !” But I gave it a try…and enjoyed some of the best sushi I’ve ever had. 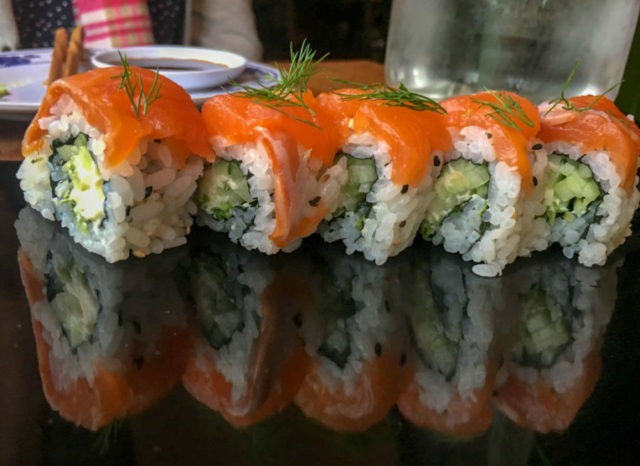 Sitting in the rustic, cozy upstairs dining room, it dawned on me that Iceland — which specializes in fish that doesn’t get any fresher — is a perfect match for sushi. This created perhaps the best of many happy-reward-at-the-end-of-a-long-day meals I enjoyed along the Ring Road. Klausturkaffi Lunch Buffet, Skriðuklaustur, East Iceland. The only part of Iceland I found underwhelming was the long, skinny, fjord-like lake called Lagarfljót — famous for its legends of a Nessie-like sea monster, and little else. It’s not worth the two-hour detour between Egilsstaðir and the Southeast. That said, for those with ample time, it could be worth the trip simply to gorge yourself at one of the best lunches in all of Iceland: the buffet at Klasturkaffi, in the basement a famous writer’s former home. Stepping into the country-cozy dining room, you’re warmly greeted by a mother-and-daughter team who lay out a delectable spread of farm-to-table Icelandic classics — strictly traditional and utterly delicious. This is Nordic comfort food at its very best; if I had an Icelandic granny, I could only hope she’d cook like this. For $35, you can eat all you like — but be sure it’s open before making the trip (lunch only, April-mid-Oct daily 12:00-14:30, tel. 471-2992, coffee-and-cake buffet in the afternoon). Hafnarbuðin Diner, Höfn. 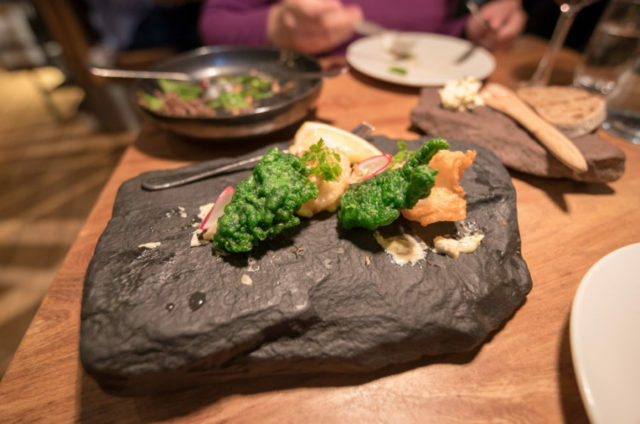 The little town of Höfn, bullied between glaciers and the frigid North Atlantic in Southeast Iceland, is famous for its humar — a local langoustine that’s served up in many different ways. 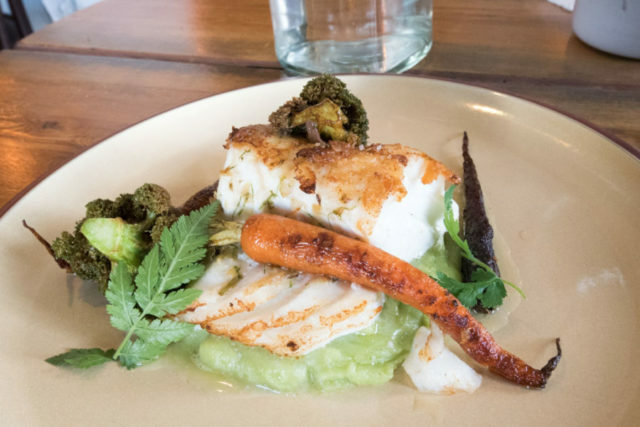 Höfn’s little harborfront has a half-dozen restaurants slinging humar dishes at a premium. But I like Hafnarbuðin for its relatively reasonable price tag and its likeably lowbrow aesthetic. Stepping into what feels like Iceland’s version of a quayside New England diner, you’ll order at the counter, then wait for a table to open up. Soon you’re digging into a $20 “humar baguette” — the local answer to a lobster roll. The $40 I spent on seafood soup was worth every single penny. Absolutely delicious. Also had a delicious cheeseburger at Solon, cheeseburger with pulled pork and bacon. Yum. All the seafood we ate was delicious. Any other suggestions for reasonable eating along the south and around Selfoss? Thx Also best grocery store experiences around Selfoss. And Selfoss tends to have the same grocery stores as Reykjavík. Bónus is cheap but without a great selection – Krónan is slightly more expensive at times but with more choice. Hagkaup and Nettó are the most expensive. Messinn in downtown old-town Reykjavík has an amazing Plokkfiskur (traditional fish stew). My husband and I were blown away by the quantify of the food. Both our meals came in cast iron skillets and were enough to be shared. We had a lovely evening there and would go back in an instant! My two favorite meals in Reykjavik. 1) Dinner at The Fish Mrkt. We skipped the main course tasting menu because I won’t eat puffin or whale) but my rock shrimp tempura and grilled Blue long were fantastic. And we loved the sampler dessert that including a licorice praline lava mousse made to look like a smoking volcano was wonderful. 2) Hotdog with everything (pilsa wins med illy) at Baejarins Betzu Pilsur. I also would recommend Fish Market. I enjoyed a nice meal of vegetable tempura. This restaurant is pricey, though. My other memorable meal was at Blue Lagoon’s restaurant where I had delicious Blue Ling with veggies. Have a you listed Rauda Husid or Hafid Blaa in Eyrabakki? Icelandic Street Food! Fabulous, friendly place with a great lamb soup in a bread bowl and a Fisherman’s Friend, a delicious fish stew. And they serve seconds! With a large can of beer dinner totaled $46 dollars for BOTH of us. Friendly owners and employees as well. And little pastries for dessert at no charge. HIGHLY RECOMMEND! I don’t know if this is true of Iceland as a whole, but as in Scandinavia, my hotel in Reykjavik included a bountiful breakfast buffet, and I took tours that included lunch. For dinner, there was a surprising amount of ethnic food–who knew that Iceland had Indian and Chinese immigrants?–with the Chinese immigrants running a “Mexican” restaurant, and I don’t remember it as being outrageously expensive, although this was a few years ago. Thanks for the post, Now I know where I can get delicious & good quality of food. I am also going to Iceland in this winters and this blog contains many useful information regarding the best Icelandic food. Thanks for this post.